This slouchy style hat is worked back and forth in stripes for the body with one seam, joining the fabric into a tube. Stitches are then picked up at one end of the tube for a cozy ribbed brim and stitches picked up from the other side form the top of the hat. I chose a colorful handspun and hand dyed yarn from Spincycle Yarns. 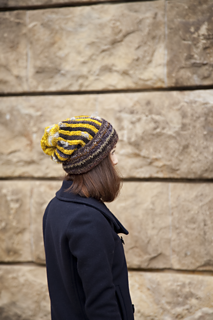 I especially loved using the yellow wool with mohair tufts. Want to know more about the yarn and how to get it?